Back in 2014, MetalMiner posted a series of articles under the collective title of “Car Wars” covering a number of related issues around the use of steel, aluminum, and composite materials in the construction of automobiles. A particularly perceptive post by my colleague Lisa Reisman countered the belief that aluminum would be the material of the future for automobile construction by exploring the development of advanced high-strength steels (AHSS) and their emerging impact on the combined holy grail of weight reduction and greater structural strength. Three years is a long time in automobile design and manufacturing, so it’s not before time that we have returned to the topic to review the extent to which AHSS grades have been adopted by the industry. I was fortunate in gaining the insight of Dr. Jody Hall, automotive vice president of the Steel Market Development Institute (SMDI) during which Hall shared some of the latest statistics illustrating the extent to which, aided by relentless innovation and research, steel remains the material of choice for automotive construction. 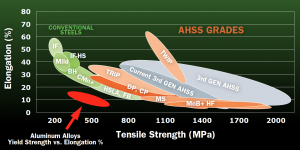 This chart, from a recent SMDI presentation illustrates how even by the industry’s optimistic projections back in 2010 the uptake of these new grades of high-strength steel have been even more rapid than anticipated. 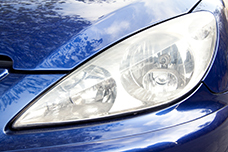 Although there are a host of reasons why an automotive designer may choose AHSS over aluminum, the two principal drivers have been safety and light-waiting. That doesn’t mean to say that aluminum composite materials do not have a future in automotive construction, but rather as my colleague perceptively predicted back in 2014, such materials have found their place in less structural applications such as closure panels, doors, and hoods where the lower structural strength is less of an issue and the reduced formability of aluminum is not a limiting factor. Steel, however remains the material of choice for the vast majority of automotive chassis and monocoque structural applications. For the foreseeable future the challenges vehicle constructors find in joining aluminum to steel will limit further uptake of aluminum unless constructors are willing, as with some vehicles in the Jaguar Land Rover and Audi ranges, to go all aluminum. A final factor in steel’s favor is, interestingly, one we have touched on in the past in MetalMiner’s coverage, but from which the impact is only just beginning to be felt across the manufacturing industry. As environmental issues take ever greater sway over decision making, the carbon footprint of the materials being used in the construction of any industrial product and the measurement and the impact of such publicly posted greenhouse gas emissions will influence materials selection, buyer demand and possibly taxation in the future. According to Hall, the automotive sector of the steel industry is acutely aware that, in spite of media criticism about the polluting effects of steel production, aluminum has a significantly higher greenhouse gas footprint even than steel and carbon footprint can be a positive benefit for steel. Both materials are recyclable but steel scrap can be more readily repurposed into any grade of finished steel whereas aluminum scrap is often limited by the high level of alloying elements. As a result, the SMDI quotes greenhouse gas emissions of 1.9 Kg/CO2e/Kg for steel compared to 8.9 Kg/CO2e/Kg for aluminum. Today, few manufacturers and even less consumers are making choices on the basis of the greenhouse gas emission footprint of the product they are buying but the trend is running inexorably in that direction. When politicians, current administration excepted, get on the bandwagon with some form of taxation the case for steel will become even stronger still. Aluminum MMI Scores More Gains, Can Prices Reach $2,000/mt? Stainless MMI, With its Supply Situation, Takes a Dip; Will Prices Rebound?